The master’s degree program is part of Bishop Jaime Soto’s strategic plan announced in March 2012, which stressed formation of the laity as one of its seven priorities. The degree requirements consist of 15 four-unit classes taken over 4 years and 3 summers. The courses are taught through a combination of face-face, video conferencing and online experiences. The ONE Campaign Lay Formation Endowment helps to underwrite the cost of this program. To be considered for a Diocesan Scholarship, applicants must have a minimum of two years’ experience in ministry (paid or volunteer) and must commit to serve for a period of time as a Master Catechist of the Diocese of Sacramento, as well to serve in his or her parish. 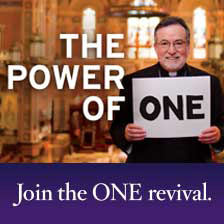 To learn more about ONE Campaign funds at work in our diocese, please visit www.onerevival.org.